In this interview, Sue Knous discusses railroadiana collecting, the various types of railroad collectibles and memorabilia, and the best ways to get involved in the hobby. Based in Colorado, Sue can be reached via her website, Railroad Memories. My husband Bill always loved trains and my grandfather had been an executive with the Denver and Rio Grande here. We opened up a little store in Georgetown, Colorado and sold railroad stuff. The Georgetown Loop Train was in that area, so we thought it might be a good spot. A gentleman walked in the store one day and wanted us to sell his memorabilia for him, and that’s what propelled us into the business. We were collectors, but not certainly the way we are now. My husband also collected coins and got a lot of coin and auction catalogs, so we decided to put together our first auction in 1987. There were maybe 150 lots, all from this one gentleman’s collection. We contacted the Railroadiana Collectors Association and got their mailing list, which at the time had a thousand plus members, and sent catalogs all over the country. That was the beginning of the full-time business. We’d had our store for about three years and decided the auction was the best way to reach people. Over the years we decided to start a subscription because of the cost of the catalogs; we couldn’t send free catalogs all over the country. We have about 600 customers now throughout the United States, Canada, Europe, and Australia. My main focus is definitely U.S. railroads, strictly memorabilia that was used on the railroads. No models or toys. The nice thing about subscribing is you get an actual printed catalog with everything photographed and a complete price list. It becomes a resource for collectors to keep up with correct market values. I lost my husband three years ago, so it’s just me now, but we did start this together and I always want make sure that he continues to be recognized. I’ve been able to continue the company we built together and I’m very grateful for that. Collectors Weekly: Do many railroadiana collectors also collect model trains? Knous: There are different types of railroad enthusiasts. There are the model railroaders, who model everything from narrow gauge to the big railroads that ran across the country. They want memorabilia to decorate their train rooms as opposed to actually collecting it for its value. Then you have the guys who chase trains all over the country with their cameras. They don’t always necessarily want to collect; they just love the trains. Everyone has a fascination with trains, even little kids today who didn’t get the opportunity to ride the trains back in the height of rail travel in the 1940s and ‘50s. There’s just something magical about a train. For a long time, it was somewhat of a male-oriented hobby, but there are many women involved as well, with the love of the china and the silver. 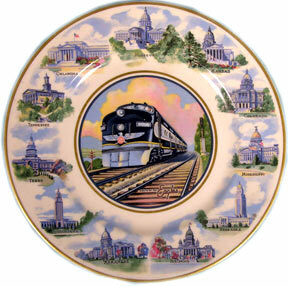 The railroads gave their passengers the best of everything – the finest linens and silver and china decorated with their logos. Everything to cater to the traveling public. You don’t get those things now unless you’re in the position to ride things like The Orient Express or some of the really fancy private rail tours, but the magic of the railroads will never go away. People really love to sit back and take a deep breath, and traveling by train is certainly a way to do that. When my husband and I were raising our children, we traveled by train all the time. On one trip, from Denver to California, we rode the family sleeper and it was wonderful. You get the whole end of the bottom of the sleeper car. There’s nothing like just laying in the train and just listening to the click-click of the trucks on the track. It’s something that you’ll always remember. Knous: There were photographers hired by the railroads to do advertising photography and posters, and all the railroads had their famous guys. William Henry Jackson, a famous photographer at the turn of the century and before, did a lot of Colorado railroad photographs and depot pictures that are just amazing. We have a collection of those, as well as lanterns and locks and keys. Colorado memorabilia is where our love is. We always say that collecting railroadiana is like baseball cards. Where you’re from is what you tend to collect. Sometimes people focus in on specific types of items and become extremely knowledgeable about them. But for the most part, people tend to love particular railroads, so they collect anything from those. Colorado railroad memorabilia is definitely something many collectors can relate to. People really want narrow gauge stuff, and because the narrow gauge lines that ran in Colorado, California, and Nevada were very small lines, the memorabilia is limited. When you find things from those roads, you definitely pay a premium. One of my biggest buyers is in England, and he collects Colorado Midland memorabilia. I don’t know whether it’s the Old West or what, but early Western railroad memorabilia is quite collectible. I do see people paying premium prices for West Coast items. 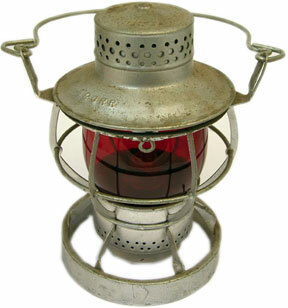 But some of the earliest roads were back east, and you find Civil War era lanterns and that sort of thing that are very collectible and historic. So there is life after Colorado. As with any collectible, it’s supply and demand. People call me and say, “I have a railroad ticket from 1880.” There were millions of tickets, so that’s not a big deal. Age doesn’t determine collectibility. The big issue is how many survived. When you’re talking about a lantern where there may be only two or three known, that’s going to get a lot of attention, versus one from a huge road like New York Central where there are hundreds, maybe even thousands. Anything from smaller railroad lines is collectible, mainly because they didn’t have a lot of stuff and there’s that one-of-a-kind thing. It’s really tough to say something’s the only one known, but we do say that if it’s the only one known within the circle. There may be others out there, but they haven’t surfaced. Collectors Weekly: What are some of the more popular railroads to collect these days? Knous: From Colorado, certainly the Denver and Rio Grande, and the Colorado and Southern. The most elusive would be the Denver, South Park and Pacific, where there’s very little hardware known, probably only a handful of lanterns. Rio Grande Southern is another. You’re talking five figures for lanterns from those roads if they came up, were in good condition, and had marked globes. There are so many railroad items to collect, from advertising items to badges, buttons, pins, uniforms, hats, china, silver, linens, locks, lanterns, keys, step stools, and ticket cabinets. We wrote Railroadiana: The Official Price Guide in 2000. I’m working on a second edition that I hope to have out this next year. The book is over an inch and a half thick, and we barely touched on all the things that are collected within the railroad memorabilia circle. It’s a fascinating hobby, and so historic. Railroads individually marked everything with initials or logos, down to the light bulbs and little pin tips, and those markings are what gives items their value. 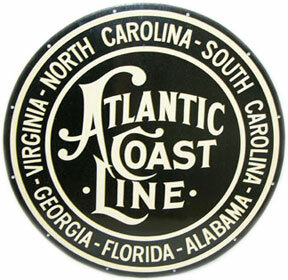 In the dining cars, many of the railroads customized their patterns with logos either on the top of the piece or the bottom, stamped with Made expressly for Santa Fe Dining Car Service, for example. Some used what’s considered stock china – the public could go to the same place and buy the same pattern – and never customized it with their railroad. A lot of times people say, “This is a pattern that was used on the railroad,” but without the customizing, it doesn’t have the value that an actual marked piece would have. The railroads did a lot of souvenir giveaways, and many of those things have become very collectible. Brochures and timetables can be valuable, depending on what road they’re from. Railroad passes were given to officials and their families. Often, if they were big enough officials, they never even had to pull the pass out because everyone knew them, so the passes are like brand new. They have to be in perfect condition, but it’s not uncommon for passes to command several hundred dollars, if not thousands, depending where they’re from. There are actually three silver passes from Colorado. They were done by Otto Mears, who started several railroads in the San Juan area of Colorado. They were all hand-done with incredible artwork. There are two other versions he did in later years that sell for $6,000 to $9,000. They were all issued to specific people and numbered. Oftentimes, the people they were issued to were famous within the railroad circle, and things like that certainly add to the value. Collectors Weekly: Why did the railroads mark everything? Knous: Probably to be able to keep their things identified. Often different railroads went in to the same depots. Some had their own separate offices, but many of them shared. The markings kept their things separate from the other railroads’. There was also the advertising part of it. When you sat down at a dining car, they wanted you to see their logo on the china, on the silver, on the glassware, on the linens, on the menus, on everything. Some dining car stuff is just bottom stamped. But it’s the side mark stuff that is more desirable, because you want to be able to have it displayed and be able to see where it’s from instead of having to pick it up and look at it. For advertising, railroads also commissioned photographs of scenes along the line. William Henry Jackson, for example, would go to spots where the train traveled and take these unbelievable beautiful scenic views of the trains on the track with the scenery – what you’d see when you’re riding that train. Those hung in depots and hotels and banks and anywhere they wanted to advertise a certain railroads. 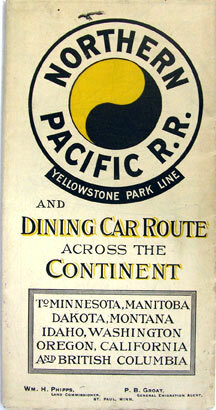 Another way the railroads advertised was through calendars. They had photographers and painters do original work for their calendars. Pennsylvania Railroad, for example, had beautiful wall calendars done on a yearly basis, measuring roughly 26 by 24 with tear-off sheets. They commissioned Grif Teller to do the artwork. There are timetables, brochures, advertising posters, matchbooks, key chains, playing cards, cups; so many things. They had little hand fans with logos on them. Those can be very collectible, especially early ones from the 1910s and ‘20s. Express items fall into the category of railroad memorabilia as well, because the express companies guarded the cash valuables that were carried by the railroad. Collectibles from Wells Fargo Express and American Railway Express, for example, can be highly sought after. Then there are what we call safety awards. The railroads gave awards to their employees for safety – doing everything they were supposed to do and having no accidents. A lot of collectible items were given away to the employees over the years. Collectors Weekly: What eras do railroadiana collectors tend to focus on? Knous: The B&O probably goes back to 1850. 1869 was the joining of the railroads with the transcontinental railroad. But as far as passenger travel, I would say the heyday was the 1920s to just before the airlines came in, because that’s when things started going down. The steam engine era was the turn of the century up into about the 1930s, and diesel is what we see now. There’s just a wonderful romance about the steam engines with the billowing smoke coming out of the smoke stack. I think people relate the diesel more with World War II, which is the highlight of the diesel era in terms of collecting. The country seemed to be at its strongest and you see the pictures of soldiers coming home and the wives running into their arms. There are certainly collectors for the diesel stuff, but I think steam era items bring more because it was earlier. The things that have held their value the most would probably be lanterns. 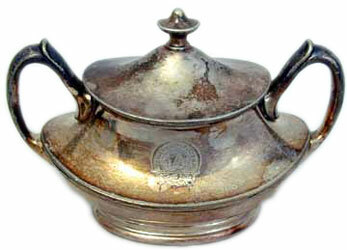 There are many different models of them and the styles changed over the years. They’re one of the most sought-after items. Locks and keys is another area. The locks were used to lock the switch stands in the yards so someone couldn’t come along and change the direction of the track. Several different people had to have access to them, so they were always keyed the same. You can still find locks from the turn of the century and the keys that match them. The locks were brass and they had raised railroad letters on the front of them. Then there’s baggage tags. When you checked your baggage, they actually gave you a little brass tag, and that’s how you got your baggage when you got back. They usually came in pairs – one that went on your luggage and one that they gave to you – and they can be very desirable. Again, they have the railroad names on them and the numbers. Another thing that’s really collectible is builders’ plates from trains, which are essentially like license plates. It identifies who built the engine and what year, and you can find what railroad that particular builders’ plate was from. I’ve sold builders’ plates and number plates from narrow-gauge lines for as much as $15,000 to $20,000. Locomotive bells are huge. They sometimes become a white elephant, but they’re very desirable and people love them. Porcelain signs is another huge area. Sometimes they can be in pretty bad shape because they were outside and exposed to the weather. But people will pay four figures easily for certain porcelain signs. Also depot clocks. Collectors Weekly: What are some of the rarest pieces of railroad memorabilia you’ve sold? Knous: The narrow gauge builders’ plates. I’ve also handled mother of pearl pictures that were done in depots for the Rock Island Railroad. They were actually inlaid with mother of pearl and not a lot have survived. There are some in museums and in private collections. We sold one about 15 years ago for $22,000. Those silver passes, too, are very rare. It’s not uncommon for really beautiful ornate passes from earlier roads to bring four figures. It’s a lot of fun, because we get to handle this stuff before we watch it go through the doors. But there’s so much fake stuff out there that you really need to know who you’re dealing with. You need to educate yourself. There’s an organization, the Railroadiana Collectors Association, and they’ve got a website, railroadcollectors.org, that talks about reproductions. It talks about shows throughout the country and people’s collections. It’s a wonderful resource for anyone interested in starting to collect railroad memorabilia. For the most part you will find that collectors are pretty generous with their knowledge. I’ll share any knowledge that I have with anyone. We all have to learn. If you get a piece of china from a railroad that was gone by 1950 and the china mark is 1970, you know you don’t have a real piece. There’s fake lanterns, fake globes, fake locks, keys, baggage tags, china, silver, signs – everything. Railroad police badges is a huge area for frauds. There are a couple of companies that actually use real badges to make the molds. They make brass cast locks too. They usually show up at flea markets. Even with my experience, I’m very leery about selling railroad police badges unless I know it’s coming from somebody who stands behind it. We wrote a book called The Railroad Detective many years ago where we compiled information from collectors that knew of things that were reproduced. Unfortunately, when that group of collectors passed on, oftentimes that knowledge went with them, so we tried to keep it going by putting it in print. Collectors Weekly: What advice would you have for somebody just starting to collect railroadiana? Knous: Join the Railroadiana Collectors Association and you get a printed magazine four times a year. You also get the membership directory, which hooks you up with collectors all over the country. The collectors in the directory are broken down by what they collect, and that’s a great way to get to know people. You can find things and start trading. You learn by getting involved with the organization. Finally, try always to buy things in good condition. Broken and chipped china, cracked china, hairline china, china that’s been used really hard, has lost its glaze, has a lot of utensil marks in the center – you really want to try and stay away from things like that unless it’s an extremely rare piece, because it’s very difficult to get your money out of pieces that are damaged or worn. You can still find pieces in good condition. Don’t buy lanterns with cracked globes. Make sure the globes are in good condition. You don’t want locks and keys rusted or in bad shape. If you’re buying things that are damaged or aren’t in the best condition, you’re going to be sitting on them an awful long time. I have 54 railroad passes dated 1912,1913 & 1914. A member of my husband’s family was associated with a railroad and they are all in his name. He was also associated with the Kate Adams, a steamboat that burned on the Mississippi River. I have a few items from it, although we gave many items to a River Museum here in Memphis. How do I put these on E-Bay? For collectors such as myself, the arrival of a new Railroad Memories catalog, or finding the new catalog posted at Sue’s website railroadmomories.com is highly anticipated highpoint. Sue and of course,Bill too in his time, are very special people, and I think I can speak for all railroad collectors, by expressing my gratitude for the special nich Sue continues to fill for us all. Thank you Sue for all the wonderful moment past, present, and future. I’m trying to find out the worth,if any? I have a big brass steam locomotive bell for sale 17.5″ Diam.complete with cradle and Horizontal Clapper marked KEYSTONE. Casting # I 1543 G on cradle. Trunion caps are bolt on. I have a couple questions about the 8ft picture called Mother of Pearl Train by Rock Island Railroad. My sister has one of these pictures and it is sitting in her basement. I haven’t seen it in years. Is this something she can sell easily? Or is this too involved? I am looking to sell my collection of railroadiana, laterns, switch stands with switch lanterns, whistle signs, station signs,paper work, tickets, switch locks with keys, target signals, oiler cans, spike hammers ,car seals all fron the PRR, and marked as such. Can you tell me or put me in contact with an estate buyer of such merchandise , Thankyou. is there any request for blueprints of pullman standard train cars? One is dated and signed from about 100 years ago. I have a Rail Road lock and key. 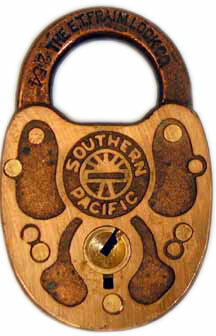 It is made by E. T. Fraim, of Lancaster, Pennsylvania and has the number 26 imprinted on it; PRR is also imprinted on the lock. It is in excellent condition and after making several attempts to obtain information on this, have done so unsuccessfully. I am hoping you may be able to help assist me in finding out what it’s worth or where I should take it for an estiment. Any informantion or knowledge you may my be able to furnish me with would be greatly appreciated! I wonder if the second edition of her new book is out yet and if so does it list the silver and gold 40 and 50 service life time passes? Yes the new edition of the price guide has been released and we are proud to say it has over 4500 photographs with 34 chapters discussing many of the most desirable and sought after collectibles in regard to the railroads. The chapter on Railroad Passes is quite extensive and we do discuss the silver passes of Otto Mears, however we did cover the lifetime passes of the Illinois Central. It would be impossible to cover everything and unfortunately it seems there is always something that was omitted. You might want to check out the website for more information. Thank you Fred and I am sorry as I re-read my response to you I said we did discuss those passes however we did not. I apologize for my error. 1945 Would any of this be of interest? My father worked for Rock Island. We found a rolled up print of a pearl train in his things. It is not a “real pearl train”, but a picture of one. It is at least 4 feet long. I have searched everywhere to find out if someone made reproductions of the original pearl trains. I would describe it as a picture/print of the pearl train. If anyone might know where this might have come from, I would appreciate any info. I have a steal vintage engine reverser (year unknown). Does anyone know about these? A couple of years ago,I bought a 6 drawer cabinet with a roll up front. It was made by Globe. After looking at it a little more I found NYC&HRRR stamped into the wood face and marked on the side of one of the drawers. Not sure how it ended up in Nova Scotia. It reminds me of a card catalogue you would find in a library. Just wondered what it would have been used for. “ ” When I was little, I used to go sneaking into my mother’s lingerie drawer. I recall sneaking into my grandmother’s, too!